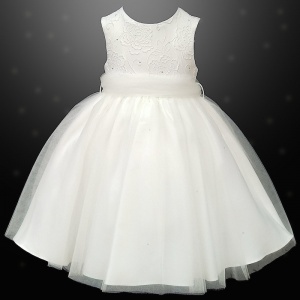 Beautiful girls ivory diamante & organza sash dress, suitable for a baby through to junior, perfect wedding wear for a bridesmaid / flower girl or for that special occasion. Dress: Ivory sleeveless bodice with an embroidered floral pattern and sparkly diamantes, with a discreet zip fastening. The skirt of the dress is just lovely ... top layer is of a sheer organza with little sparkly diamantes on the front, satin underlining that has a tulle underlay. Sash: A removable ivory organza net sash is to the waist so you can place the bow at the front, back or to the side. 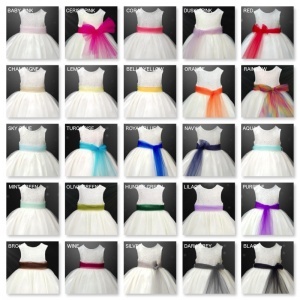 For an additional charge, change your sash colour to suit your theme from aqua, baby pink, black, cerise pink, coral, dusky pink, lemon, mint, navy, purple, rainbow (multi-colour), red, royal blue, silver, sky blue, turquoise or wine. Photo doesn't do it justice. For the price I was expecting what you pay for. However,I had to check it wasn't the wrong item posted ! This dress was far superior than the ones we had looked at leading high street stores and half the price. Beautiful little dress. I'm over the moon with it. Have brought this for my baby granddaughter to wear at my wedding, she looks gorgeous! Good value for the money, quicker than expected delivery, also quick returns fund as one of the dresses was generous in size and needed the smaller size. Thank you.